"My mom made these cookies when I was growing up. They're called Buffalo Chip Cookies because of their big size. I hope you enjoy them as much as I have." Combine the margarine, sugars, eggs and vanilla. Stir in the flour baking soda, baking powder, raisin bran, oats, raisins, coconut, chopped nuts and chocolate chips. Mix until well combined. Drop large tablespoon sized scoops onto a baking sheet. Bake until golden approximately 10 minutes. 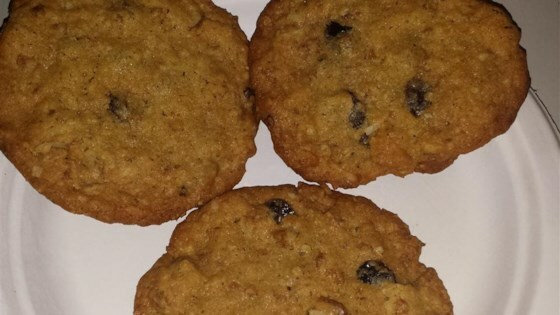 Chocolate cookies with corn flakes, chocolate chips, coconut flakes and raisins. insane amounts of sugar. over 500 calories for one cookie!